The Annex cottage: Usually used has an extra bedroom, has two double beds, fire place and bathroom. Ole-itiko Cottages formerly known as Ol-Joto is a beautiful venue, situated in Kongoni, past Oserian flower farms on the South Lake Road of Naivasha. The charming cottages situated on Ol Oldien Lake, which used to connect with Lake Naivasha is a very quiet part of Naivasha and offers lovely walks down to the lake filled with abundant wild and bird life; especially flamingos that make it their stop off point at some times during the year. The sheer beauty of the location, peaceful, serene environment plus high level of service, attracts both local and foreign tourists to this area. The camp features cottages, each with it's own private veranda overlooking the water hole and built in the style of a game viewing hide and offers unrivalled wildlife watching. Ole-Itiko houses 4 cottages, Ol-Joto I & III which hold 6 guests comfortably, and Ol-Joto II which holds 4. There's also an Annex cottage that acts as a spare bedroom and can accommodate 4 guests. Ole-Itiko cottage 1; Has 2 double beds and 2 singles. It can hold six people and has its own kitchen, dining room, verandah and lounge area with fireplace. Ole-Itiko cottage 2; Has one double King size bed, 2 single beds and can hold four people.The two bedrooms rooms are en-suite and the cottage has its own kitchen, dining room, verandah and lounge area with fireplace. Ole-Itiko cottage 3; Has three double King size beds, and can hold six people. One bedroom is en-suite and the cottage has its own kitchen, dining room, T.V with DSTV, verandah and lounge area with fireplace. The Annex cottage; Is a single stand alone cottage with a fire place, en-suite bedroom with two double beds and can fit four people. 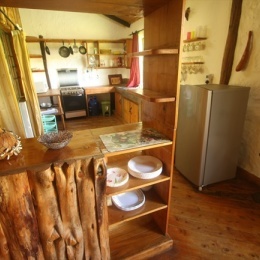 The Cottages are self catered that is guests bring their own food and drinks but a cook is usually at hand to prepare meals for them, set the tables and do the tidying up. World class hotels and restaurants are also available close to the cottages for breakfast, lunch or dinner. The host's photos show better images than what you get. Generally it was a great experience; lovely environment. It was absolutely fine. The guys were so nice and friendly. Only nice things to say about the trip. Thanks. Thank you very much we had a great time at the cottage.